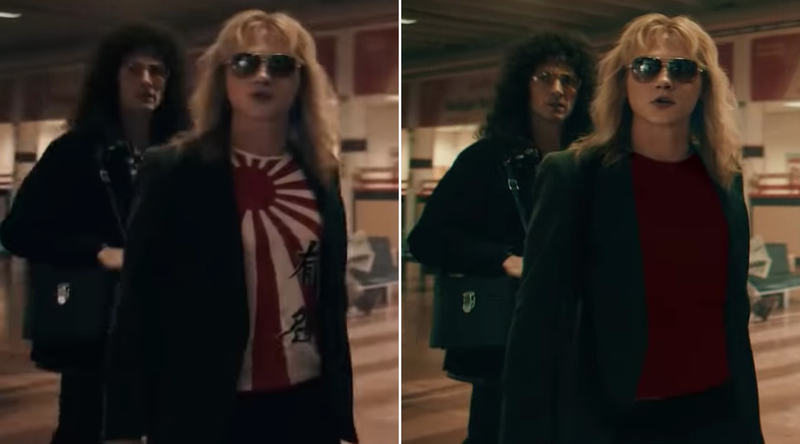 In the Queen movie Bohemian Rhapsody, a t-shirt was digitally changed as not to cause offense. While the traditional motif has long-standing associations that have nothing to do with late 19th-century and 20th-century Japanese imperialism and aggression (for example, it’s also a traditional fishing motif) and while it’s still used by the Japanese Navy, the design evokes painful history for many of Japan’s neighbors. After initial complaints about the t-shirt’s design, it was soon digitally changed. As website Koreaboo points out, Gwilym Lee, the actor who played Brian May, also recently came under fire in South Korea for uploading a photo taken in Japan that featured sun-ray type imagery. In the photo, the ray design is red on yellow and the not the red and yellow of the Rising Sun flag. It was one of several photos taken and uploaded during the film’s Japanese release. According to Koreaboo, reaction to the photo varied with some online saying the actor didn’t know while others demanded an apology. Lee appears to have removed the image from his Instagram.